A boy played the first VRMMORPG 『Another World』however he didn’t notice that he was actually transported to another world. Follow his journey as he misunderstands things and stirs up some action. This is an interesting take on the "clueless MC" trope. Unlike your standard "MC is a dense moron who never realizes anything for no good reason", the MC truly believes he's playing a game. And who can blame him when he was told he was getting a chance to Beta test the latest VRMMO, and he has all the standards of an MMO like stats, skills, overlays, and the key ability to logout. If you could logout of a fantasy world, take a nap, and watch some TV, wouldn't you... more>> think you were playing a game? It also doesn't help that this world seems to perfectly align with the setting of the game, locations and events included, so the guides and tips from other players all match perfectly. This creates some funny interactions between the MC and the natives. Him operating on the assumption of this being a game sees everyone as NPCs or Players. So when he encounters someone and helps them assuming they are a Quest NPC but then doesn't get a quest, he misunderstands and thinks the other person is a player and he committed the forbidden act of "kill stealing", causing him to run away. Meanwhile the girl he just saved simply wanted to say thank you. As I read all the chapters. I must say this novel is great. The Avatar that Protag use is connect to an Isakai world. And he is the only one like that. That world use the same system as the game Protag current playing. As a player, Protag is over power compare human/ demon/ vampire in that world. He also search web, wiki, forum to know how to build. There are three country in this world. Main character makes totally 3 characters. 1st for test player, play time 1 week and he will save that country by chance. 2nd for close beta test, play time 1 month, he will meet the heroine, the saint and her knight servant. As the first time someone asking for his help, he party with the girls for months. He use premium item EXP booster to help heroine and her lady knight change to 2nd job. He help heroine build the Sage supporter build. He become a Wizard. And the knight servant become Berserker. By chance Heroine save the whole town in a great invasion and was worship as a saint. She was in love with Main character but her father doesn't allow it. Her father broke the dragon cane that Main character craft for her in front of her. His character got deleted again. 3rd for open beta test. He choose the 3rd country that he never play before at starting point. He got a super rare gacha mount house carriage and he try it for the first time. When he test run in town, he run over a demon that chasing the princess of this country. He help the princess run away from demon to meet the Duke, the princess's uncle. Together they fight to get back the throne from the demons. The Duke, princess Uncle was KIA and he try use premium item to revive him. He realize it before that this world isn't a game but reality. Still he try to fool himself and turn blind eyes to it. He fail to revive the Duke and break down in crying. The third country in control of the Demon wave war with 2nd country where the heroine live. As a saint, the heroine must come together with army to attack the 3rd country. And there we go, the tragic meeting with the Heroine the saint, Main character the saint's teacher. I really love the game element novel. I remember reading this at syosetsu before and it's a good "Misunderstandings" type of novel for me 'cause unlike the usual Dense type of misunderstanding the MC really thought at first that he's just playing the game due to the fact that he can always log out into the real world. There was a time when he goes to an alchemy shop and he gave the basic potion formulas to the child of the alchemist and after he leaves the father-son duo finds that the formula was already lost from the aeons of time. And to some people who wants to know if the MC will finds out if the game he's playing in is a another world then the answer is a big YES, he will learn it when the demons invaded the kingdom he's staying in. This story is one of the best that I've ever read in terms of VRMMO theme to transported. Though I think the author should prolong the story a little bit more because the readers crave for more chapters. But still the ending is good, they reunited at the end. Nothing more will I wish as it is a happy ending. Awesome story, love the misunderstandings, no ludicrous harem. Downside is translation is rather SLOW considering that each release is only half of a chapter, and the erratic period of time between releases. 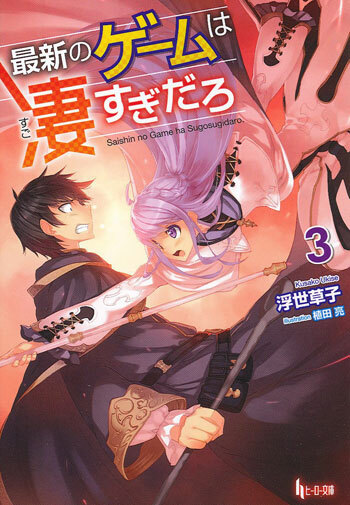 Translated chapters as of now has only finished volume 1. While Raws already finished volume 5. With vol.6 yet to come out. Thats what mtl is for. ;) Still I am grateful to have these chapters as it introduced me to this novel happy reads! Just finished reading the raws and I have to say this story is amazing. It's a VRMMORPG/ISEKAI novel with actual plot and living characters. Despite this being a hilarious misunderstanding comedy, there are consequences for every action. This is one of the stories that makes learning a different language worth it.